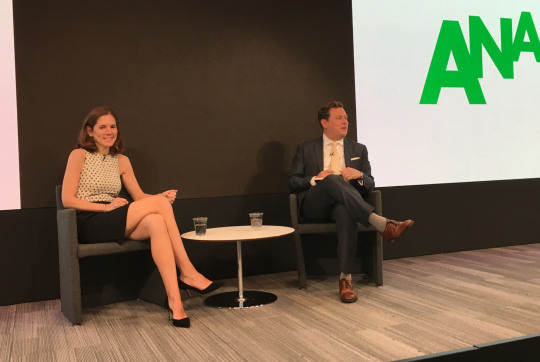 Yesterday morning at Bloomberg’s New York headquarters, Bloomberg Media Global Chief Revenue Officer Keith Grossman kicked off an ANA members-only conference on sponsorship and event marketing with an interview of Amy Sokotch, SVP of Media and Partnerships at Citi. Their wide-ranging conversation showed how Citi is combining consumer value, social purpose and emerging technology to propel sponsorships into a new domain. Sokotch described how Citi delivers access to thousands of events for consumers, through such large-scale partnerships as the Citi Concert Series on TODAY and cardmember-only opportunities produced in conjunction with Live Nation. Using proprietary technology, the company’s in-house experiential platform also allows it to activate smaller, more localized opportunities. Extending that special factor beyond the event itself is the goal. Sokotch and her team are meeting that challenge with key innovations that make sponsorships work harder, building out impact across a cohesive program. When the dots get connected between big initiatives, she said, “it makes each one feel bigger.” For example, she explained, Citi taps into its entertainment access program to provide cardmembers with opportunities to support No Kid Hungry, an organization that works to end childhood hunger, by attending culinary events like Taste of the Nation. Similarly, the company’s popular New York Citi Bike initiative has let riders earn dollars for partner charities just by taking a ride. Importantly, those tie-lines are supported and enhanced by digital technologies. Experimenting with and investing in the wide-open possibilities tech introduces is also helping Sokotch break the traditional boundaries of event experiences. New ways of interacting and making connections for Citi have included virtual reality (VR), livecasting on social media and nimble content creation. The power of VR, Sokotch said, lies in its ability to create “access beyond attendance” – a mantra for the Citi team. That can allow, for example, a cardmember to experience a concert live from their own home using technology such as Samsung Gear. Demand is already high, even as VR is a still-developing interface. In one instance, Citi worked with NBC to offer VR headsets for a Citi Concert Series on TODAY performance. Within 24 hours of sharing the offer on Citi’s social media platforms, “we had about 40,000 responses,” Sokotch said. Facebook Live video is another way Citi is building positive associations with its Today show concert partnership. These real-time sessions bring fans intimate interviews with artists performing in the concert series; fans can ask questions and learn more about band members, whether they’re attending in-person or across the country. And Citi has launched an exclusive concert series of its own, the Citi Sound Vault. Coinciding with the Grammy Awards earlier this year, the series hosted such rock icons as Sting, The Chainsmokers and Metallica for sold-out shows at the historic Hollywood Palladium. Meanwhile, an on-site social media team, complete with legal advisors to help navigate compliance needs, “churned out content – gifs, videos, and more – that brought a really exciting, ‘you are there’ feel to Citi’s social feeds,” Sokotch said. Technology is also helping Sokotch track these efforts, allowing her team to follow customers through experiences and more deeply understand their needs and responses. That, in turn, can be used to measure success and feed into new ideas and programs as they’re developing.